So you’re all done with your polymer clay creation and you want to put a varnish on it. You ask other clayers and get recommendations for the best brand to use. But once you get to the store, you realize there’s more uncertainly. Some of the containers are labeled as gloss and some as satin, still others are matte or even semi-gloss. Which one should you buy? 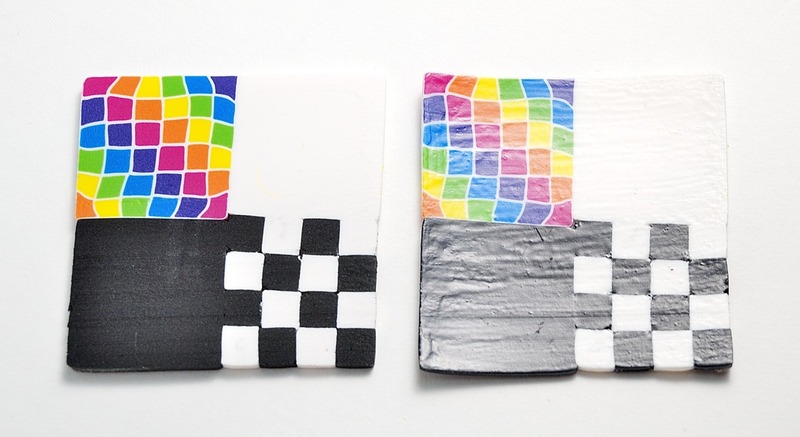 How can you find the right gloss levels in polymer clay varnish? First, before we go any further, I want to be clear that you don’t need to seal polymer clay except in specific circumstances. You will introduce problems if you choose the wrong varnish You can even ruin your work. So do make sure to use the right one. If you’re still sure you want to use a varnish, then never mind me…carry on reading! If you’ve ever painted a room, you likely are familiar with semi-gloss, satin, flat, and eggshell finishes available in both interior and exterior paint. Those terms are similar for varnishes, and have to do with how much light reflects from the surface. Glossy finishes reflect more light to your eye and matte finishes reflect less. Here are the most common terms and how they relate to each other in shine, starting with the shiniest. No one brand uses all those terms, and there are no standards to allow a comparison of gloss level across brands. One brand’s matte can be shinier than another brand’s semi-gloss, for example. The term “flat” is generally used in hardware store paints, but in artist and craft products the term “matte” is more commonly used. They’re the same concept. 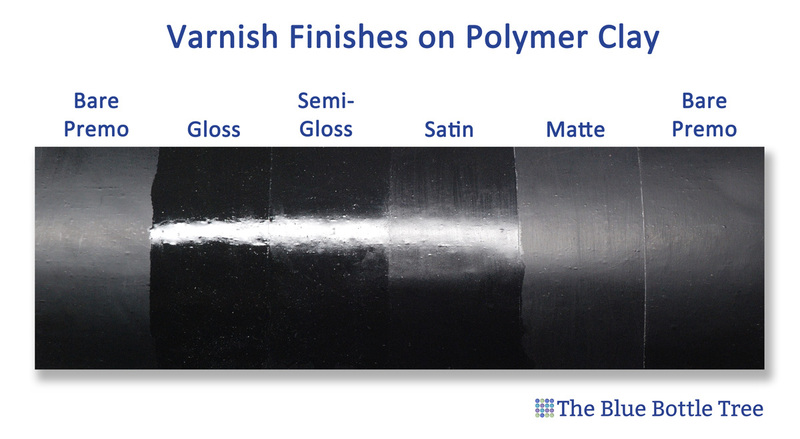 Knowing how these terms relate can help you understand gloss level when choosing a polymer clay varnish. The most common terms I find on varnish labels are gloss, satin, and matte. Some varnishes brands also feature a semi-gloss variety as well. Above you see a piece of black Premo that I marked off with masking tape and applied various classes of varnish to illustrate how gloss levels appear when they’re on polymer clay. You can easily see the different levels of shine. You’ll notice that at each end is plain, unsanded polymer clay. What determines the gloss level of a varnish? You might be surprised to know that the chemical makeup of most varnishes is glossy. To dull the finish and create a more matte surface, manufacturers add matting agents to varnishes. Matting agents are fine particles of a substance, typically made from silica, suspended in a varnish to make the dried surface reflect less light. Varnishes that are more matte have more matting agent. Because the matting agent must be suspended evenly, it’s very important to mix varnishes and paints thoroughly before applying. Use a stir-stick for this, such as a popsicle stick. Don’t shake the bottle as this introduces bubbles and can even make a varnish frothy. You can often seen the matting agent settled in the bottom of a bottle of varnish, in fact. If you don’t stir matte varnish before use, you can end up with a glossy effect or streaks of uneven glossiness. Some brands of matte varnish also include a thickener which keeps the matting agent suspended and stirring is not as important. I still stir, however. Have you ever noticed that a beach pebble is brightly colored when in the water, but dulls when it dries? That’s because the sand’s abrasive action causes tiny pits in the surface of the pebble, scattering the light. When you wet the pebble, the water fills in those tiny holes, allowing the light to transmit in a straight path to your eye. Glossy varnishes work the same way as water on a beach pebble, filling in the holes and making the surface smooth so the light can reflect. Matte varnishes do just the opposite. They make a surface microscopically uneven, scattering the light. Matting agents make the surface invisibly uneven, scattering the light so the surface appears dull to our eye. And just like that dried beach pebble, a matte surface will also appear less colorful and more dull. In some cases, the matting agent itself can cause a whitish cast over your bright colors, dulling them. For this reason, it’s best that you don’t use a matte varnish on mica powders, metallic and pearl clays, or glitter. The matte effect will dull the sparkle. Use a glossy varnish for the most sparkling effect. 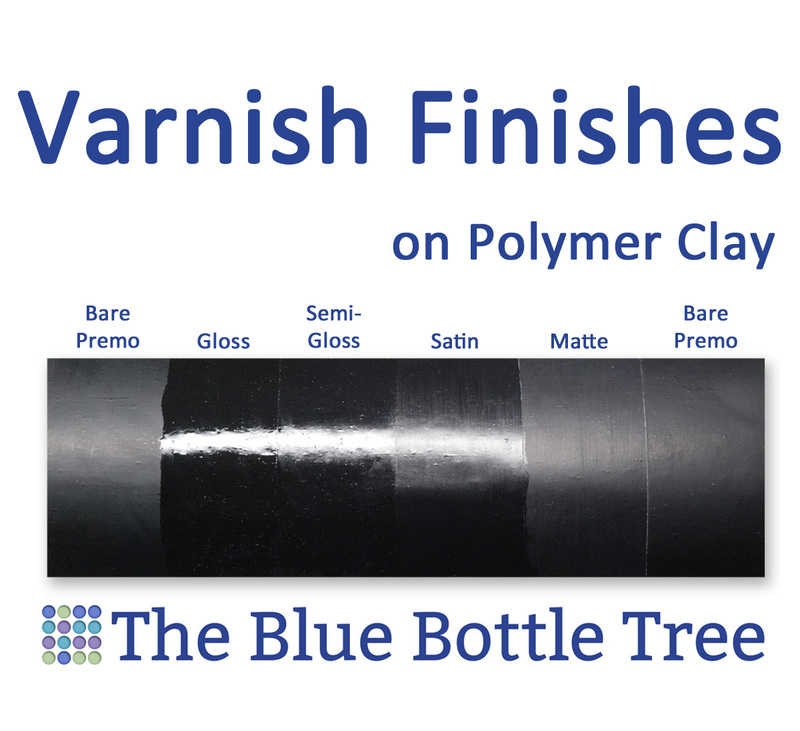 While varnish can change the gloss level of your clay, it can’t make a surface more smooth. Even when you make everything super smooth before baking, polymer clay often shows up with small bumps after baking. We do try to remove fingerprints and tool marks before baking, but sometimes we don’t see them until afterward. It’s a common misconception that adding a varnish will smooth out these bumps. In reality, a glossy varnish will just accentuate these surface flaws. It’s no secret that I’m not fond of varnishing polymer clay when it’s not necessary. It’s actually quite hard to get a flawless, super-shiny finish with varnish because of brush strokes, dust specks, and surface irregularities. Some brands do give a good surface, but others make so many brush strokes that you’re better off not even using them! Here’s an example of brush strokes on a tile made from Fimo Professional. On the left is bare, on the right shows three coats with Sculpey Satin Glaze. In this case, it would have been better to do without the varnish! Another huge problem with varnishes is that many of them never fully dry or become sticky over time. Some varnishes (and paints!) are softened by the plasticizer in polymer clay and get sticky. Always test your varnish on the brand of clay that you will be using. Yes, the clay brand matters! Many varnishes work well on one brand of clay but become a sticky mess on another. This is the reason you get so many conflicting answers when you ask about suitable varnishes in online groups. I did test 40 common polymer clay varnishes on five brands of clay, so do check my Testing Clay Sealers article to get the scoop on which varnishes work and which ones don’t. If you want to create a super smooth surface with your polymer clay, you’ll need to use a clearcoat with a thicker body to it. Resin and dimensional glazes can both give this effect, but both are difficult to apply thickly on rounded or contoured items. 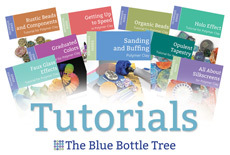 To learn more about the various clearcoats we use with polymer clay, check out my article on Understanding Polymer Clay Glazes, Sealers, and Varnishes. If you’re not using any surface products (such as mica powders, paints, or glitter) and you don’t have a lot of sculpted surface detail, the best way to get a super smooth and glass-like surface is to sand and buff your clay. Sanded and buffed surfaces are incredibly smooth and shiny with no worries about getting sticky, peeling off, or turning colors. Don’t be afraid of sanding and buffing, though. It’s easy when you understand how. If you’ve always struggled with sore hands and bad results when you’ve tried this type of finish, consider getting my Sanding and Buffing eBook. Don’t sand harder, sand better! Love this article? Share it on social media! I’ve added new buttons below that will create the posts for you, making it effortless to get the word out. You can even share to your favorite polymer clay Facebook group by using the dropdown at the top of the sharing dialogue. Cool! Thanks for another great article! And I love the new buttons at the bottom of the page. I read somewhere that acetone (not for nail polish removal) can get rid of finger prints. What is the correct method to using this? You just use some on a q-tip, on baked clay, to slightly dissolve the surface. It’s one of the many tricks that I talk about in my Sanding and Buffing eBook. If I want to put polymer clay on a coffee mug and then bake both, would I need to seal the baked clay as I would need to wash the mug? Polymer clay is waterproof and there is no need to seal it. Varnish will eventually break down when exposed to repeated washing. So adding varnish actually reduces the lifespan of your mug.